Fewer than three out of five youngsters leaving primary school in the poorest parts of Scotland are meeting expected standards in literacy, new figures have revealed. And just two-thirds of these pupils are meeting the expected level in terms of numeracy. In the most deprived areas in 2017-18, just 59% of P7 pupils met the expected standards in literacy. This compared with 83% in the most affluent communities. Education Secretary John Swinney said he was encouraged to see the attainment gap between the most and least deprived had narrowed slightly. 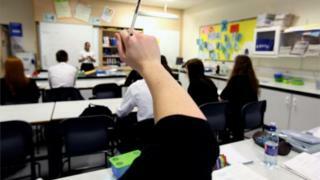 The figures also show that teacher numbers have increased to an eight-year high. Annual Scottish government education figures showed 70% of P7 pupils across Scotland in 2017-18 were meeting the expected standard in literacy, with 75% achieving this for numeracy. In the most deprived parts of Scotland last year, just 59% of P7 pupils met the expected standards in literacy, compared with 83% in the most affluent communities. Meanwhile, two-thirds (66%) of P7 pupils in the poorest areas achieved the expected standards for numeracy, 20 points lower than the 86% who did so in the least deprived areas. "Pupils from the least deprived areas performed better than pupils from the most deprived areas at all stages," the report noted. While 85% of P1 children met the expected standards for numeracy, this fell to 76% for P4 pupils and 75% for those in P7. Three-quarters (75%) of P1 pupils were at the expected level in terms of literacy but this fell to 69% for P4 before increasing slightly to 70% for P7 youngsters. Scottish Conservatives education spokeswoman Liz Smith said: "There remain some grim statistics which will make worrying reading for parents and teachers right across Scotland. "The fact that one in three pupils is leaving primary school without reaching basic standards in literacy is the main worry. "These literacy figures aren't just bad news for the prospects of youngsters, but bad for the future economy too." Scottish Labour's Iain Gray was also critical over the "utter failure of the SNP government to tackle attainment". Education Secretary John Swinney pointed to a four percentage point increase in the overall proportion of primary pupils assessed as achieving the expected levels of Curriculum for Excellence. He said: "This coincides with the first year of our £120m Pupil Equity Fund. "While it is too early to draw direct conclusions from this data, I am encouraged to see the attainment gap has also narrowed slightly. "The average size of primary one classes has been dropping consistently in recent years, which is particularly important as helping children in the early years is crucial if we are to close the attainment gap between the most and least deprived." Scottish government statistics also show overall teacher numbers, including those working in early learning and childcare centres, are the highest they have been since 2010 at 51,959. As a result, the teacher workforce in 2018 is 447 higher than it was the previous year. But Larry Flanagan, general secretary of the teaching union EIS , said: "We also have a large increase in the number of pupils in our schools which means that pupil-teacher ratios remain at an absolute standstill compared to last year." Elsewhere, the data showed 86.6% of Scotland's school buildings were in a good or satisfactory condition as of April this year, up from 81.7% in April 2012. Reality Check: Are standards slipping in Scotland's schools?